Impressive mountains such as the 1,722 m Wallberg surround the Tegernsee. This lake, around nine square kilometres in area, is six kilometres long and around one-and-a-half kilometres wide and bordered with a charming mixture of woodland and meadows. 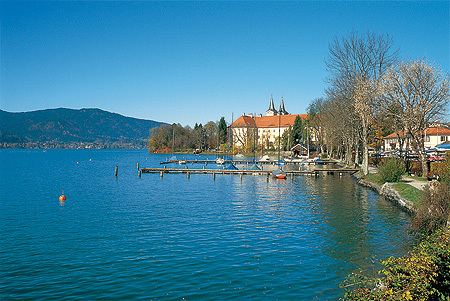 Because of its attractive setting, the Tegernsee has been one of the most popular recreational and holiday areas in the Bavarian uplands since the idea of summer holidays was first introduced. There are many places of interest, including the former monastery church in Tegernsee, the parish church in Rottach-Egern and the spa facilities in Bad Wiessee. The local councils and the state of Bavaria have succeeded in re-establishing the Tegernsee as one of the cleanest lakes in Europe, with the help of a system for purifying waste water from the area surrounding the lake which was constructed in 1960. The Tegernsee is around 50 km south of Munich and can be reached via the A8 motorway from Munich to Salzburg (exit Holzkirchen) and the B318. Footpath by the lake from Gmund to the former monastery of Kaltenbrunn.